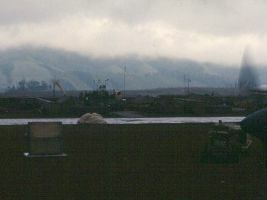 Khe Sanh was the staging area for the Lam Son 719 invasion because it was just 10 miles from Laos. Its 3200' runway was ready for use February 15th. For some reason the USAF always called it Ham Ngai. 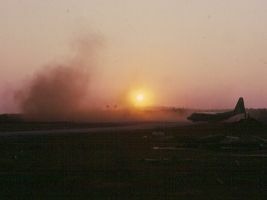 There was a continuous stream of C-130's flying in and out, so artillery-free corridors were arranged with the army to avoid friendly-fire accidents. These corridors also helped smooth out the air traffic. 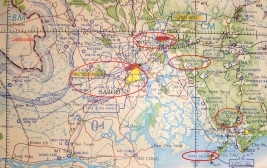 The inbound corrider was from Hue to the southeast and the outbound corrider was to Quang Tri to the northeast. 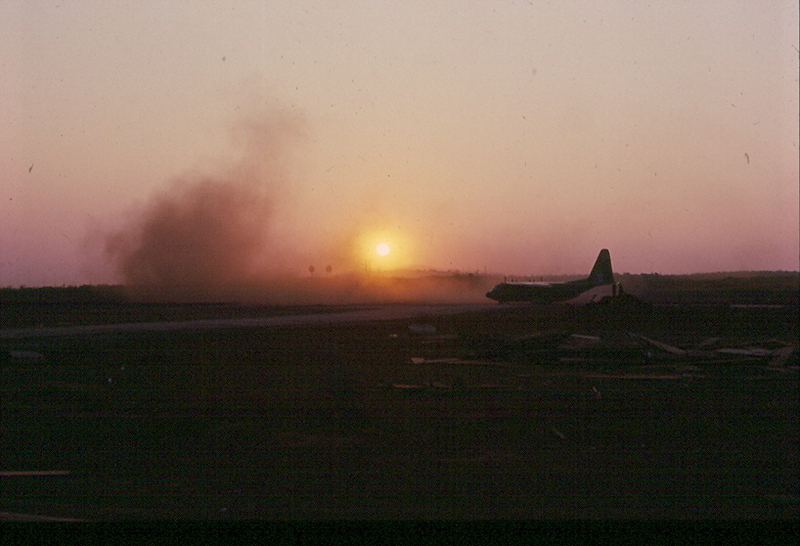 Because the first stop on my frag schedule was Khe Sanh and after reading the airfield folder and being briefed on the corridor procedures and talking with other crew members I expected it to be pretty hairy. 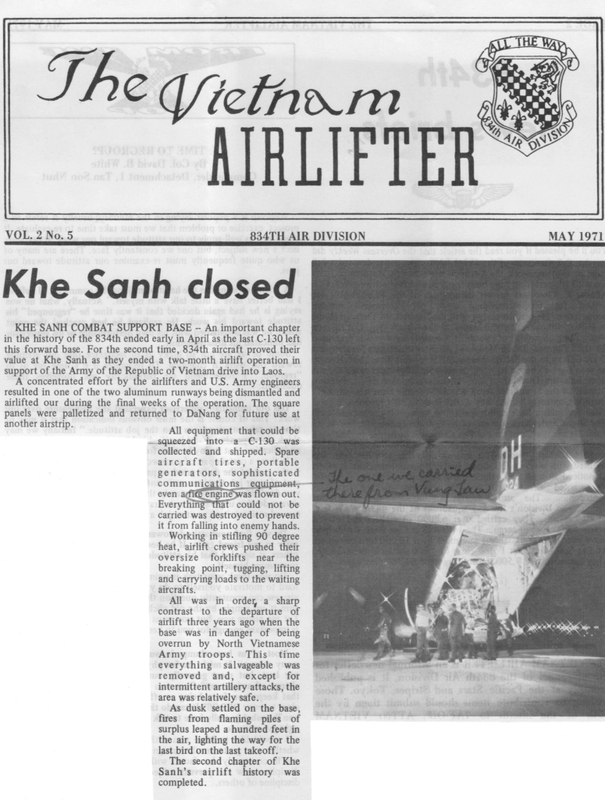 We first blocked out with a load of ARVN troops, cases of vegetables, coops of chickens, and two pigs--when I got on the airplane I thought that smell was familiar! 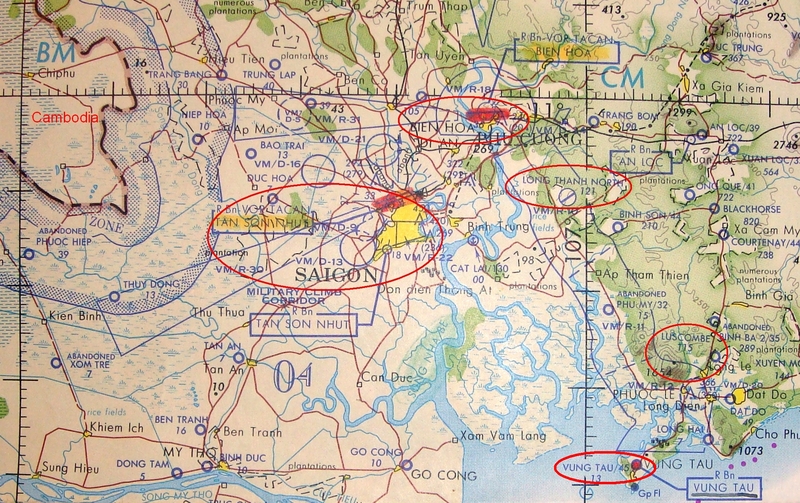 However, as we taxied out Saigon Tea (TSN ALCE) told us to return and take over another mission of a higher (Combat Essential) priority. So we and our troops and chickens and pigs taxied back in and parked. 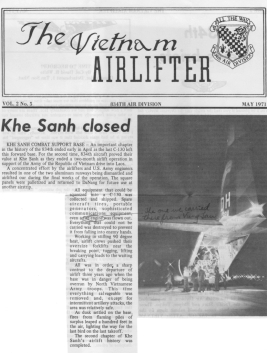 We flew an empty airplane down to Vung Tau and picked up a fire engine. Because of our destination I had the loadmaster put additional chains on it, which he didn't appreciate (sorry, Steve). Khe Sanh was actually a piece of cake. The aluminum matting runway was quite good, the corridors in and out went smoothly, the GCA whent smoothly, and I even made a good landing. I was glad to be able to take Col. Rogers his mail from Det One too--I sure know how much receiving or not receiving those letters can mean. We were spozed to carry a 35,000 lb. forklift to Khe Sanh but decided not to because it was just too heavy. Loadmaster Steve Hank reported that this two-axle 35,000-lb. forklift was way over the 13,000-lb single axle weight limitation on the floor. So after considerable hassle with various colonels, majors, and captains we took drums of Peneprime (used to keep dust down) instead. Landing at Hue a warning light told us that the antiskid system was inoperative on one main wheel. 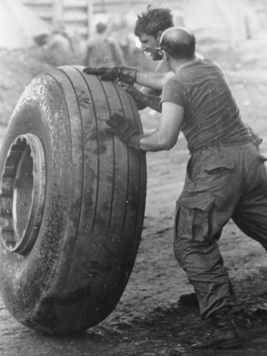 But I decided to press on to Khe Sanh anyway. Mission hacker. 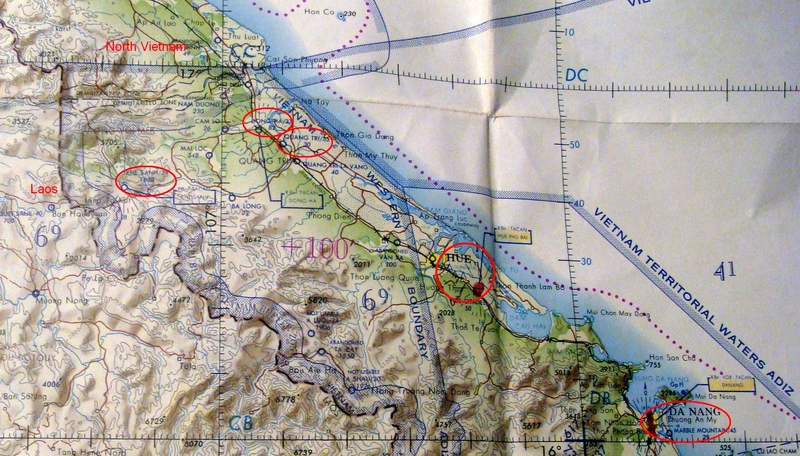 As we taxied out to the runway, the air was filled with choppers and the tower frequency was filled with instructions. Tower cleared us to take off, so I put the power to max and released the brakes. As we started to roll, a helicopter from the right flew across the runway directly in front of us--idiot. I crammed on the brakes and aborted the takeoff. I put the props into reverse pitch and started backing the airplane up toward the beginning of the runway. Meanwhile loadmaster Steve Hank opened the ramp and told me when we reached the beginning again. 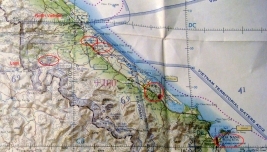 With a wary eye out for helicopters we leaped off for Danang for fuel. Our troublesome wheel was now leaking brake fluid, but fortunately we had no more short field landings ahead. So we just capped off the brake line (leaving 3 good wheel brakes) and leaped off for Tan Son Nhut feet wet. Enroute near Phu Cat we listened to an F-4 jock with a crippled airplane punch out near a beach and get picked up by a helicopter. All this is getting too much like war for my taste. A rather disquieting day. 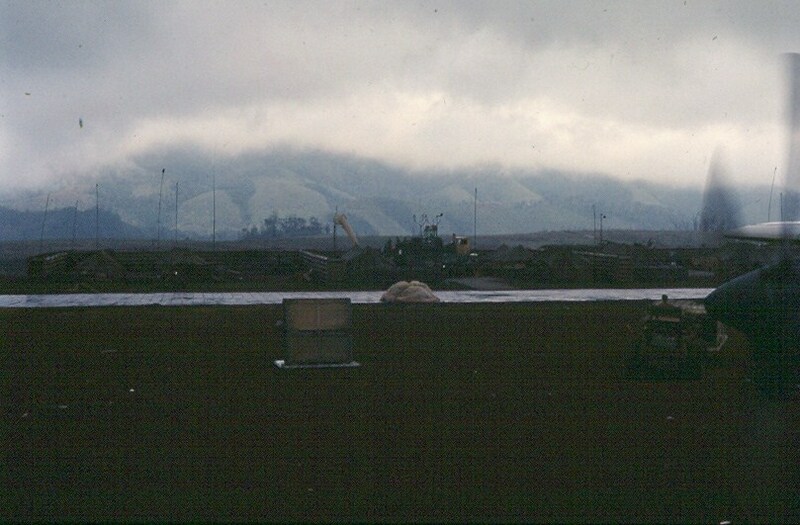 Withdrawal of the ARVN forces from Khe Sanh was complete and the aluminum runways (now two) were disassembled for use elsewhere.